Visibility/Location: Driving into town on the main road there is an unlit sign that says haunted house, turn there and it leads to the town square. If you try to turn onto 5th street using GPS the road is barricaded since there are two haunted houses on that street. 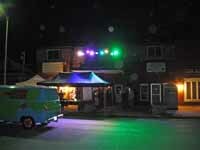 The Auburn Haunted Theater had colored spotlights at the top and a couple of tents out front. There is free parking on streets around the haunted theater and on the town square. Wait Entertainment: Once you bought tickets to Auburn�s Haunted Theater there was plenty to look at. Starting off with an informative table for St. Jude Children�s Research Hospital and games for children to play for prizes. Jim O�Rear, magician, musician and actor from horror movies like George Romero�s Day of the Dead had a table set up with items to purchase. A new movie entitled The Hospital was also for sale with a limited number of autographed copies from the cast. Some of the proceeds from this autographed DVD will go to St. Jude Children�s Research Hospital. An original studio owned Mystery Machine van was waiting in the street for patrons. For future dates, Larry Mainland and Sonya Thompson, the �walkers�, and Theodus �Big Tiny� Crane from AMC�s, The Walking Dead will be available for a meet and greet. There is a limited number of tickets sold each night. Crowd Control: Tickets were purchased in groups. You let the ticket seller know how many were in your group and he would write your group number on an index card and hand it to you with your tickets. Someone would call your group number and you would then get into a short line at the entrance. Patrons were spaced out very well. No groups caught up with us and we did not catch up to any other groups. The actors moved patrons through the haunted theater at a good pace. This is the Auburn Haunted Theater�s 5th year as an attraction. The haunt takes place in the basement of an old movie theater built in 1946. They say some of the past patrons to the theater have never left. As you entered the house you walked through the longest �air bag� enclosure that I have every walked through. It seemed to go on forever. After passing through this warped entrance you found yourself at the top of the stairs to the basement. A dark figure then handed you a pair of glasses and you proceeded down the stairs. Once down the steps, you put on your glasses and you entered a menacing world of neon colored clowns and skeletons. I have been to 3-D haunts before; but the props and painted walls were done very well. Some hallways you actually had trouble finding the exits because the painting was so well done. Halls and rooms would zigzag back and forth in the haunt. Some rooms contained dead ends to make you backtrack. Only at the end did you see a little clown asking you �did you have fun� and �I hope you have fun�. You then handed your glasses to another clown and entered into the depths of the basement. The smell of the damp basement here added to the gloomy sense of the haunt. With more twist and turns through dimly lit halls you came upon a room with a child screaming for help. Once in the room a mad �pig� man lit up the room with electric sparks and barrels jumped and banged. A vomiting zombie topped off the room with a water spray. I actually ended up with wet pants from the knees on down and wet socks. It was well worth it. Some more twist and turns through hallways and you arrived at a room with a crazy boy executing his dad, head smashing style. The illusion was good but from the point where we were standing it seemed out of focus. But still the bloody mess was a nice visual. Then onto a demented bedroom of a little girl that should not be allowed to have any dolls. The girl played an amazing creepy character; but then added a little humor into the scene. She would come up to you with her magic wand and she would touch you and then say �Boop� in her sweet melancholy voice. A room painted all in white with a strobe light really added to the confusion of the basement. With one actress in white that seemed to bounce around the room eerily. The door seemed to jump back and forth on the wall making it really hard to find your way out. Towards the end you are invited to attend Dead Wally�s funeral and his wife will ask you to pay your respects. As you walked out of the room his casket closed. All I can say is that I don�t like clowns and Dead Wally comes back from the dead. He is not friendly, I might add. Back up the steps to exit the basement and you actually come out into a store that is called Unique Enchantments Gift Shoppe. Owner, Brandy Kristin has a little bit of everything you need to start off the Halloween season. A lot to look at and a fellow avid lover of Nightmare Before Christmas. All the actors did a job well done keeping in character. The theater had a nice mix of make-up and masks and not masks that you would purchase at a local retail box store. My one critique would have been the 3-D part of the house. There were missed opportunities for scares since it was just a walk through and no actors in the 3-D part. Auburn Haunted Theater always does a nice job to scare patrons, with jumps here and there. This year what I really liked is that all of their proceeds go to the St. Jude Children�s Research Hospital. There is no better way to spend money on a haunted house that you know will help others. Make sure when you are near Auburn that you make a point to stop at Auburn�s Haunted Theater.